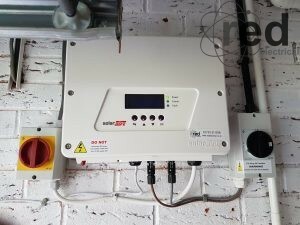 RED Electrical - PV Solar Energy Ltd - the worst solar installer ever? I was recently called out to investigate a solar PV system not generating, which the customer suspected was down to a faulty inverter. The customer told me that the installation was carried out by PV Solar Energy Ltd from St Helens. I have come across several of their installations before. Fortunately they ceased trading in 2013 but not before they had completed many poor quality and indeed dangerous installations. 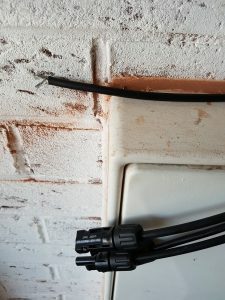 The a.c. cables between the inverter and a.c. isolator, then to the FIT meter and consumer unit were wired in solar PV cable. 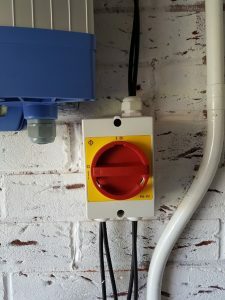 Whilst this is not non-compliant, it isn’t what the cable was intended for and is an indicator that the installer was working to poor standards. This is much more of a concern. All isolators are designed for a particular purpose, and this particular one is an a.c. isolator rated at 25 amps. It is designed for use in mains a.c. applications, where the voltage follows a sinusoidal waveform that passes through zero volts, 100 times per second. The nature of d.c. is that the voltage and current are constant. This makes it much more arduous for components than a.c. and therefore a specific d.c. isolator is required. The customer told me that he had seen smoke coming from this isolator. When I removed the front cover there was a strong smell of burning. This could easily have resulted in a fire, threatening the family. The cables entering the top are from the solar panels on the roof. 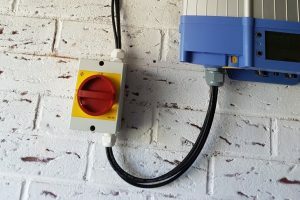 The installer had crammed two 4mm² solar cables into each of the lower terminals, delivering 700 volts from the solar array to the 600 volt maximum inverter. These are MC4 connectors, which are purpose made for use in solar photovoltaics. The internal terminal of the connector is designed to be crimped onto the cable with a special tool, which makes for a mechanically strong low-resistance connection. Unfortunately many installers (including this one) chose instead to squeeze the terminal onto the cable using pliers. In this case it meant that one of the MC4s came off its cable while I was disconnecting it from the inverter. Poorly fitted MC4s can have a high resistance, which can generate heat and cause melting or fires. It is worth considering that if the MC4 connectors here are badly fitted then it is highly likely that the ones on the roof are done in the same way. The system had ceased generating because the inverter had failed. Its maximum input voltage is 600 volts, but as the panels were connected in a single string, the open circuit voltage would be approaching 700 volts in some conditions. Its premature failure is therefore unsurprising. Some manufacturers produce high voltage inverters, but there are not many of these and they are quite expensive. Using a high voltage inverter would mean that we could keep the single-string configuration of the solar array, but this does not alleviate the worry of poorly fitted MC4 connectors on the roof. The solar array cables on the roof were also unsupported and likely to cause future faults, so it was decided that getting on the roof was inevitable. This necessitated a scaffolding to safely access the panels. Getting on the roof would allow us to install an extra pair of cables down to the garage, so that the solar array could be divided into two strings and therefore be compatible with many more brands of inverter. However, the customer wisely chose the alternative of having his system upgraded with SolarEdge optimisers and inverter so that he would get improved yields, a 20 year warranty and excellent monitoring. 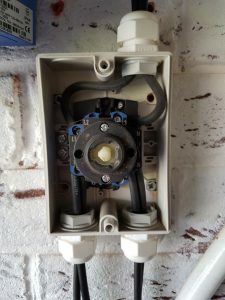 Needless to say we also fitted a ‘real’ d.c. isolator and sorted out the other ghastly parts of the installation. This system will now give many years of trouble-free service, backed up by an excellent warranty and support from a reputable installer (us!). The cost of this project amounted to around 18 months of the system’s Feed in Tariff payments, but there are now no costly future surprises for this customer.